Jan 6 Wouldn't It Be Neat If These Bowl Games Meant Something? 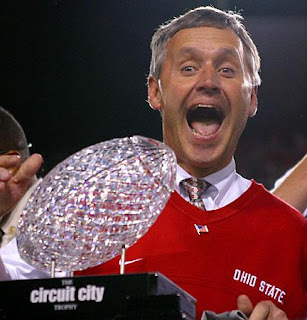 I know it's a tired discussion, but as I watched OSU figure out yet another way to make the Big Ten look weak to the naysayers, I couldn't help but think it was a great game and that I wished it actually meant something (plus, it gives us a chance to run one of our favorite photos yet again). But, really, OSU-UT meant nothing last night. Had Texas blown them out then maybe they could make an argument for the AP title. But, again, what's that worth? A bunch of writers saying you're the best? Whoop-dee-doo. And as much as Thursday night's BCS title game between Oklahoma and Florida has the potential to be fantastic, will the winner of that game be the unquestionably best team in college football? Not even close. Couldn't USC give any of these teams a great game? What about Utah? Haven't they at least earned a chance to show they're for real? At its simplist, wouldn't it be neat if last night's winner (Texas) were to play USC and Utah got to play the winner of Thursday's game and then those winners played? Wouldn't that kind of sort it out without all that much trouble? We've talked about it before, but a very simple, small playoff of sorts would sort it all out very nicely. Would someone like Texas Tech still be pissed? Sure, maybe. But that's better than it being the current mess where nobody's really happy. And maybe the place to start is to stop arguing about whether the bowl system or a playoff system is better. Can't we just say: "Girls, you're both pretty. Let's do some kind of combo." Again, keep all your meaningless Mineke Car Care Bowls for the 6-5 Notre Dames of the world. Have fun, guys. You're "champions," in your own special way. But let the big boys actually sort this out, using the existing BCS bowls as the playoffs. It's not all that hard and it wouldn't diminish the regular season at all. But let's even, for sake of argument, say it slightly diminishes the regular season -- isn't that worth it for the amazing matchups and pretty much undisputed champion you'd wind up with? See, your Cinderella has a shot, because Utah is in there. And we all know they beat Alabama, though in our system they wouldn't play first. OK and Fla get byes and Texas plays Utah while Bama and USC battle. I'll assume USC beats Bama and we'll pretend Utah upsets Texas. Then the Utes get Oklahoma and the Trojans get Florida. Who wouldn't love a USC-Florida matchup? Then the winners of those two games meet for the national title. Wouldn't there be a hell of a lot less arguing?